Vocals, percussion, acoustic & electric guitar. A sultry & powerful vocalist, accompanying herself with feisty acoustic rhythm guitar, Sarah Howard is an experienced musician. Sarah can adapt to any 'live music' environment & is a natural performer. With over 15 years of music experience, Sarah is currently living in Spain, where she is regularly performing solo, duo & band gigs in Spain & Gibraltar, working as a full-time musician & performer, with both solo, duo & trio projects...and a 6-piece band! Sarah comes from a musical family, her mother sings, and her father plays anything with strings! He is also an ex BBC sound engineer, with a huge guitar selection, and he has a recording studio...which is handy!! Sarah began singing and playing guitar during her teens, and started to perform live and write songs. Both writing & recording at 16, and starting to learn the guitar, Sarah soon formed a collaboration with a fellow "folk" youngster Kellie While, an amazing vocalist & guitarist, who is still very active in the UK music scene, & both Kellie & her mother Chris While were a huge influence on Sarah's musical development. Soon after a small stint in the Northern Folk Scene, Sarah went to University in London, studying Media Arts, and after graduating she moved back to Manchester. It was on her return that Sarah began to play live all around Manchester, with a residency at the Comedy Store. As well as playing with various Bass players in her solo acoustic work, she worked with a number of gigging "Funk Rock" bands. After a few years, Sarah discovered a more urban & funky side to her musical tastes & began to work with Soulful Funky House music producers in Manchester, doing a large number of vocal recording sessions. Using a variety of styles from haunting melodies to funky, rock & pop, as well as singing vocal sessions for House music producers, she is a versatile artist. Sarah has recorded 4 excellent acoustic albums, as well as an album with her band, and has had a “Hed Kandi” track released 2009 "Daco (feat Sarah Howard) - Keep Calling". In her solo act Sarah plays both originals and cover versions, and tailors each night depending on the audience and venue. As well as her own material, she has a range of 200+ cover versions, which she offers to audiences in the form of a “song menu” from which they can hand-pick their favourite songs from the list for her performance, and this has proved extremely popular! Sarah loves to sing and play, and she lives and breathes music!! Dagmar is an experienced keyboard player from Havana, Cuba. With over 30 years music experience, his first instruments were the Cello & Double bass, as well as a little drums. He later moved on to the piano, studying for 6 years at the prestigious "National Arts School of Cuba (ENA)" in Havana. Dagmar is now a talented piano player, & has been living in Spain for the last 11 years. Dagmar travelled a long way from Cuba to University, to the city of St Petersburg in Russia. He spent 6 years in Russia, and has a Masters Degree in Engineering. During these early years, although his home country in the Carribean taught him the music skills and a love of Latin & Salsa Music, he also discovered the wonderful world of (illegal) "American" music, and he soon became a huge fan of bands like Earth Wind & Fire, Kool & The Gang, Stevie Wonder & Michael Jackson! 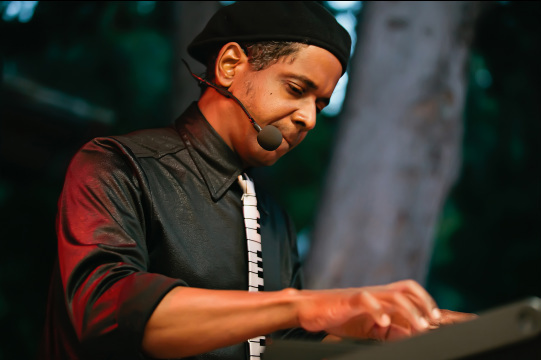 This gave Dagmar the inspiration after 20 years of playing Salsa Music in various bands and touring Orchestras, to form his first "funky" band, playing English and American music, his other great passion! It was during this time, here in Spain, that Damar and Sarah met when she joined his band as lead singer, and they soon realised, although from very different backgrounds, that they had a common love of similar music, as well as a dedication to improving and playing at a high standard, rather than just playing music for "fun"! Dagmar Fuentevilla has played in many countries, including, Cuba, Mexico, Russia, Spain & Gibraltar, as well as playing with both Latin Orchestras & American-stlye funky bands! In the Maia Project he plays 2 keyboards with synthesizers, playing bass lines, drum beats, synth sounds, strings, classical piano...basically any sounds you can get from a modern keyboard! Dagmar also plays a little percussion, on the Cajon (Spanish "box" hand drum), or Djembe, as well as singing backing vocals and sound engineering. Dagmar loves funky music, RnB soul, disco, jazz and a large variety of English & American Music & styles......but being from Cuba he also has "Latin" music in his blood, and he also currently plays salsa music in his OTHER band "Club Havana" a Cuban Salsa Group.